SymCom is an industrial, electronic control manufacturer. They manufacture motor protection devices under the brand names of MotorSaver®, and PumpSaver®. Their motor protection products sense the power supplying a load, such as an electric motor, compressor motor or pump motor. If a problem is sensed on that supply power which will damage the motor, then our protectors disconnect the motor before damage occurs. Their motor protectors sense problems such as: high voltage, low voltage, voltage unbalance, single phasing, phase reversal, over current, current unbalance, clogged pipes (in pumping systems) and dry well (in pumping systems). 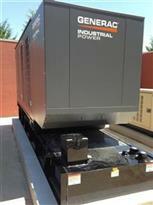 If your need is for continuous long term AC power – then a generator may be your solution. We offer equipment from a variety of manufacturers! Single or three phase systems, automatic transfer switches, diesel, LP or natural gas. In some cases we can coordinate installation if necessary. For information on grounding products, please contact us at info@ecsintl.com .